When the North Trail coffee shop Big E's closed up last fall, frugal locals felt verklempt. The shop had maintained a reputation as perhaps the most budget-friendly eatery in the area. You could get a sandwich, a side and a beverage for, I swear, $4.50, unthinkable at almost any other spot in Sarasota. After Big E's shut its doors, I felt confident that things would never be the same, that whoever took over the restaurant would surely attempt some kind of upscale rebrand, turning it into the kind of place where the servers call mayo "aioli." Shudder. Luckily, World Bites Kafe took over. And while the price point has gone up, it hasn't spiked dramatically. That's not to say things haven't changed; the whole space has been redone. The left wall has been painted a deep eggplant. The right one, dubbed the "galleria," is white and decked out with art. Apropos of the restaurant's name and its mission, a bronze globe sits on a stand in one corner. A regular globe rests on the counter near the swiveling tablet register. The concept behind the menu is ingenious: global street food. That means Korean tacos come to the table alongside jerk chicken and caprese salads and delicate cups of Turkish coffee. My friend Tim and I will take it all. Café owner Peter Miletich is working today. He personally whips up everything we order, which is a lot. Lunch starts with a shopska salad ($5), a chunky blend built with cucumber, tomatoes and feta and doused with a vinaigrette. The vegetables are fresh and crisp and the feta's pungent, but the bowl turns a little soupy. It's fine, nothing more. Luckily, the tacos ($5 or two for $8) are much more impressive. 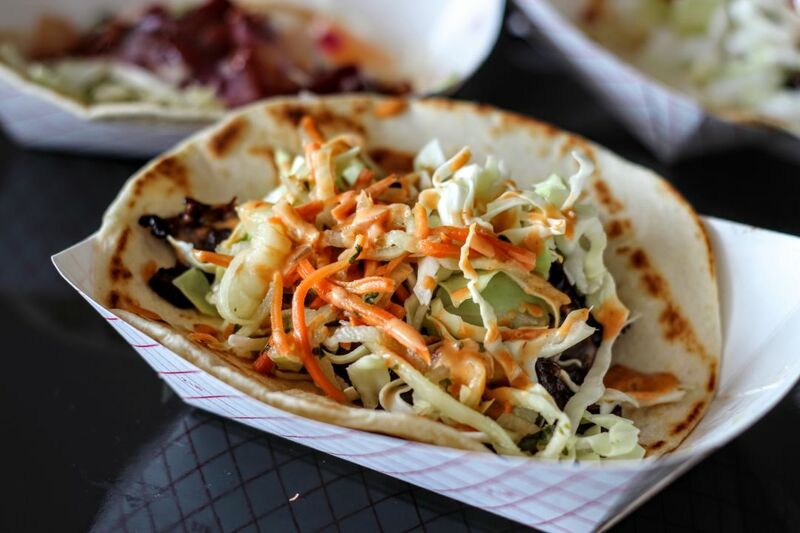 My favorite: a flour tortilla stuffed with Korean bulgogi, ginger, cilantro and a slaw dominated by carrots and cabbage. The beef is exquisitely seasoned, providing a salty, juicy base for the crunchier items above, and a drizzle of Japanese spicy mayo adds a smother of smoothness and fat to everything. Coming in at second place is the restaurant's Caribbean-themed taco, which includes jerk chicken, pineapple salsa and barbecue sauce laced with ginger. I do wish the jerk carried even the slightest bit of heat, but the mix of savory and sweet here is on point. A third taco mixes roasted mushrooms and other vegetables with a dollop of a red pepper-based sauce. A fourth features kebab beef with your typical gyro condiments. Both are good, but the bulgogi and the Caribbean taco are the standouts so far. World Bites has only been open 10 days; Miletich tells us that after years of running World Bites as a mobile food op, he's got an extensive backlog of menu items he's looking forward to trying out in the restaurant space. I can't wait. In addition to its food, the eatery offers up an interesting beverage menu, with sweetened iced teas ($2.50) blended with ingredients like cherry and aloe, mango and cilantro, and ginger and basil. Miletich whips up a pair of Turkish coffees ($2.95) for us, as well, drinks that double as supernatural fortune-predictors. We sip our cups of strong, lightly sweetened coffee till only the grounds remain at the bottom of the china cups, then we flip over our the cups and wait five minutes. Flip the cups upright and see what shapes have dripped down. Miletich isn't much help. A horse means very good luck, he informs us, but beyond that, Tim and I are forced to rely on Google. Tim tells me my volcano means I'm out of control (in a good way, I hope) and that the tree that shows up in his cup portends wealth and vacation. A nice omen. Big E's may be gone, but just 10 days in, World Bites Kafe is doing cheap food right. That's a nice omen, too. World Bites Kafe is located at 2805 N. Tamiami Trail, Sarasota. For more information, call 448-0007 or visit worldbiteskafe.com.